Duke Marsh has fun giving us reasons to cross our eyes. But seriously, humans have the ability to view 3D imagery with no glasses at all. Free-viewing is the term used for this special way to see 3D. Free-viewing comes in 2 flavors, cross-viewing and parallel-viewing. On this page we will discuss cross-viewing and you can learn about parallel-viewing here. So how does crossing your eyes let you see 3D? Well the photographer sets up the stereo pair with the 2 images switched so the left view is on the right and the right view is on the left. You focus closer than the image so your gaze has each eye crossing over and then each eye sees just one image. Since the images are crossed and your gaze is crossed you see the correct image in each eye and the 3D effect kicks in. Start by viewing the image at a comfortable distance of about two feet. Step 1 – Cross your eyes softly until you see four images instead of two. Step 2 – Then relax your view so the images move together and you see only three images. 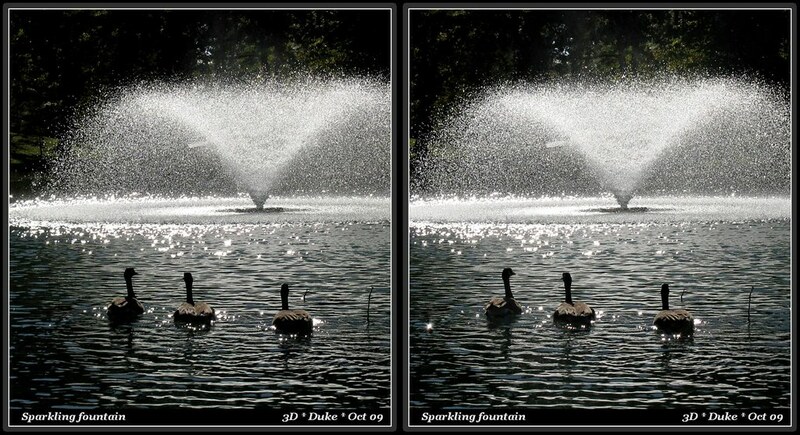 Step 3 – When you see three images, stop changing your focus and you will see the center image in 3D. Step 4 Optional – Raise your hands to the sides of your eyes to block out the two outer images so you see only the center one in 3D! HINT: If you’re having trouble, changing your distance from the screen by moving back a little sometimes makes it easier. Also take a break and try again later — being relaxed gives better results. Some people think this is magic, well in some ways it is. The fact that our brains can process the subtle differences in the views from each eye and translate that into the perception of depth is magic. Duke has had fun exploring and exploiting the magic that is cross-view stereo. Enjoy Duke’s eye-popping images below but remember as with magic you can not always believe your eyes. Duke is active on Flickr here. Duke is blessed with a creative imagination which goes along with his other creative talents in the field of music and astronomy. Thanks very much for the kind words, Brian. I just found your site and absolutely love it. I especially enjoy the manner in which you present your photos for viewing (with the boarders around each photo) plus I really appreciate the work involved in the artistic photo manipulations. If you get a chance I would love your feedback on my site. I am a cruise ship lover and have just started a blog about that. While I am only at the point where our Grand Canyon trip is being posted, there will be cruise photos shortly. Thanks, I will be a regular here, I love your work.